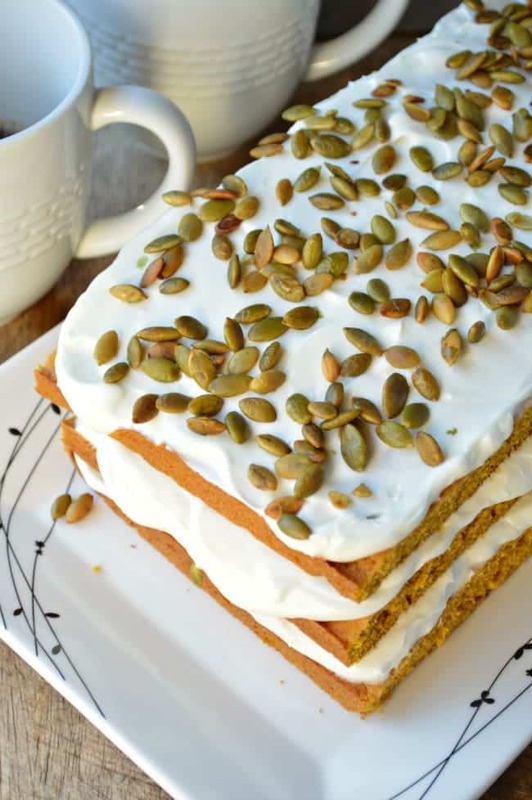 Pumpkin Torte Cake is a holiday favorite! 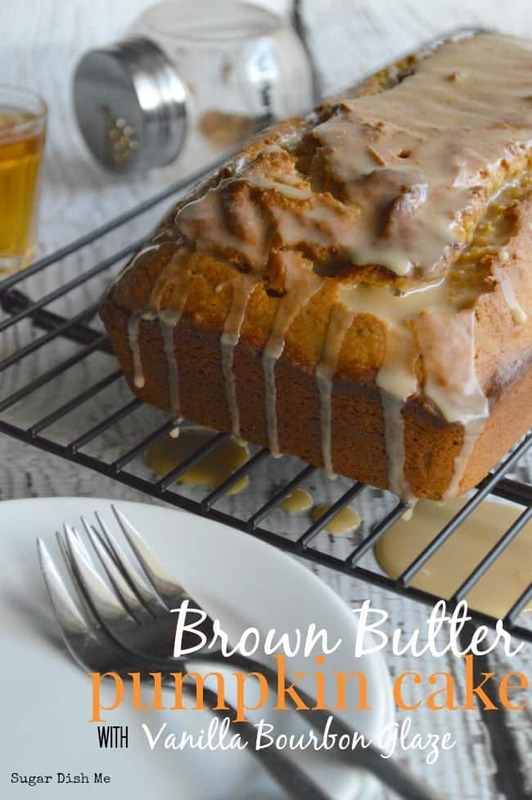 A basic quick bread recipe baked in a sheet pan, stacked, and then piled high with the best cream cheese frosting. This post dates back to 2012. But it’s a recipe I have made for yearrrrrssss. 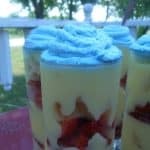 It’s simple, quick, and makes for an impressive dessert at a party! So impressive that I used to sell them around the holidays! Updated photos, same great recipe. It never fails me. Is one of my favorite things EVER. I also have no idea why it’s taken me so long to post the recipe. Nevermind – I take that back. I know exactly why its taken me so long to post this recipe. It’s because the resulting cake is kind of gigantic and completely wonderful and I was sort of worried about having it hanging around my house lest I end up eating the entire thing all by myself. I used to sell these cakes. They come together reeeeally easily and they make a serious impression. I adapted this recipe from one of the very first things I ever learned how to bake all by myself when I was 9 – banana bread. A few years back my sister and I were playing in my kitchen having one of our talk/play with food/drink two bottles of wine meeting of the minds (P.S. -sisters if you are reading this can we do that sometime soon, please?) and this cake just kind of happened. No doubt one of our very best happy accidents to date. This torte would make some people very happy on Thanksgiving probably. Same old flavors, different presentation. Go crazy. Speaking of crazy… can i just let you in on the fact that I haven’t slept in like two days? Andrew underestimated the magnitude of his language arts project and he and I were sprawled across the living room floor amidst a pile of magazine clippings, crayons, Elmer’s glue, and scissors yesterday. Also we had to bake cupcakes and frost them to look like a plant cell. Okay, we didn’t actually have to do that one. It was extra credit. And we are over-achievers. I have a few other awesome and slightly off-tradition holiday dessert recipes for you at the beginning of next week. 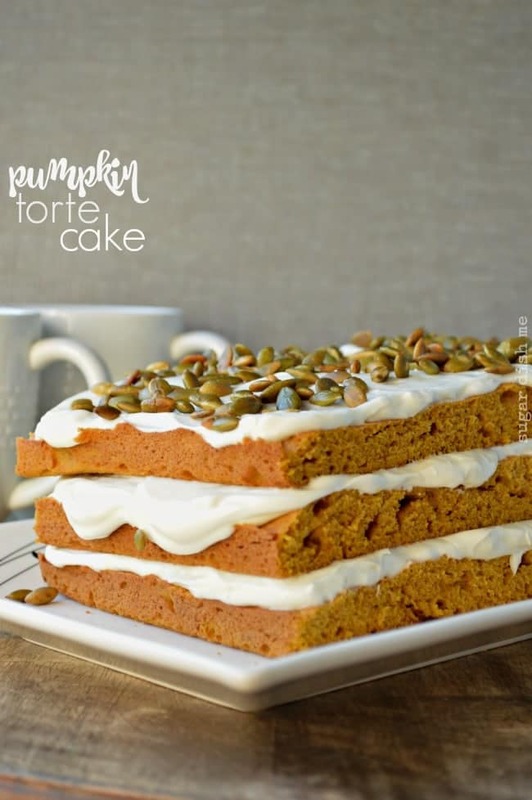 In the meantime, make a pumpkin torte. It’s almost Thanksgiving!!!! That means it’s acceptable to have it for breakfast. What are your dessert plans for next week? I need to know all about them. Pre-heat the oven to 350. Butter the bottom of a quarter sheet pan (9 X 13). In a large bowl cream the butter. Add the sugar and beat until smooth, then beat in the pumpkin. Slowly beat in the eggs. In a separate bowl whisk together the flour, baking soda, cinnamon, ginger, cloves, and salt. Gradually add the dry mixture to the wet and beat until smooth. Spread it evenly in the prepared pan. Bake for 12-14 minutes, or until a toothpick inserted in the center comes out clean. Let the cake cool completely. While the cake is cooling, toast the pecans and make the frosting. To toast the pecans, scatter them evenly across a baking sheet (you can spray it lightly with non-stick cooking spray if you’d like) and place them in a 350 oven for 3-5 minutes until they are fragrant. Watch them closely!! Pecans are easy to burn. To make the frosting, beat the cream cheese and butter together until light and fluffy. Sift in the confectioner’s sugar and beat, starting on the lowest speed (so you don’t end up wearing the powdered sugar) until it starts to come together. Add the vanilla and beat until smooth. When the cake has cooled, cut it into thirds. To assemble the torte, trim a very thin slice off the sides of each cake third that were against the side of the baking pan (see photos for example). This just makes it uniform in appearance all the way around. Spread a layer of cream cheese frosting (a little less than ⅓) over the top of one of the thirds, pushing it all the way out to the edges so that it will peek out the sides when stacked. Repeat the frosting and layering. Top with pepitas or toasted pecans. Refrigerate until you’re ready to serve. 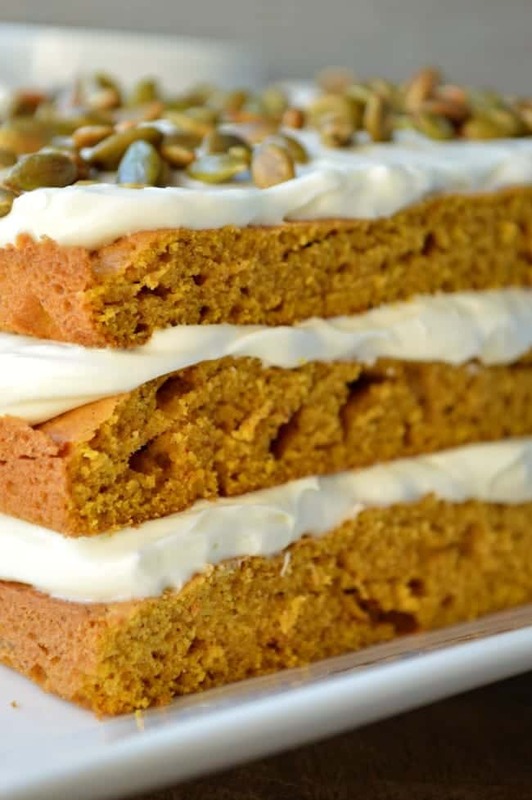 Ha, I know I’m always saying “I love this” and “I love that”, but really, pumpkin is one of my all-time favorite ingredients. And cream cheese frosting is half the reason I like Red Velvet cake and Carrot Cake. 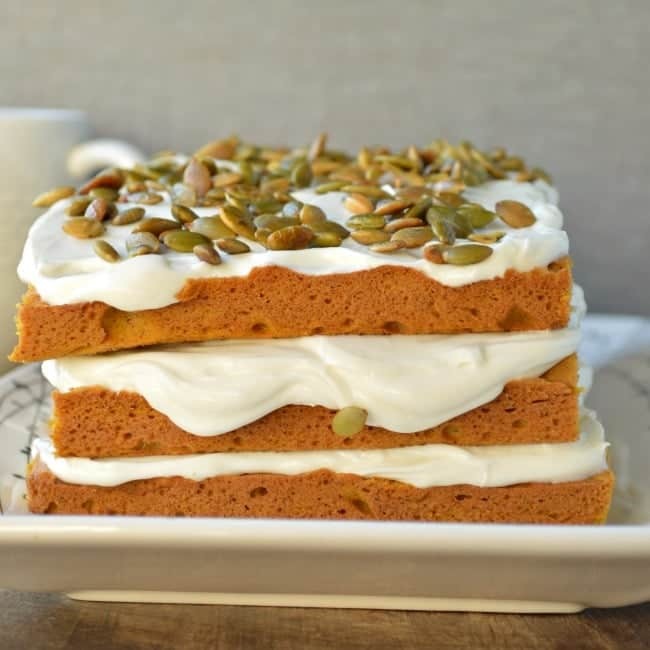 Put pumpkin and cream cheese frosting together? It’s magical. This looks so neat and delicious! Hey Colleen! Thanks!! 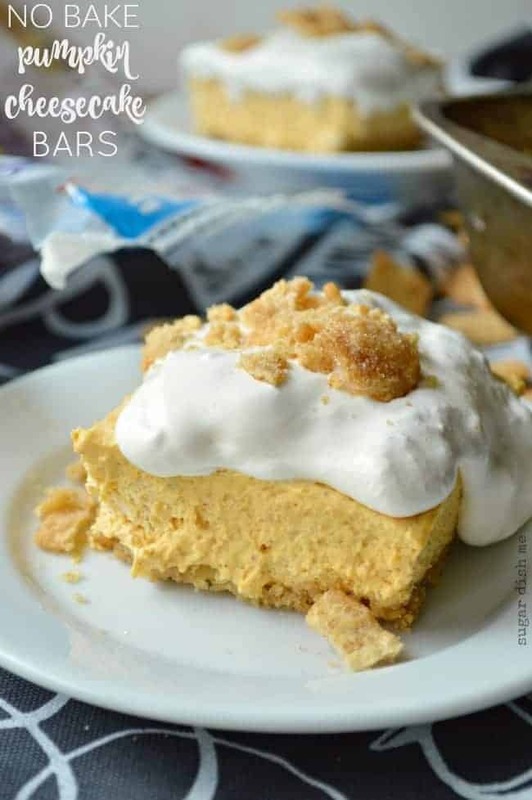 This dessert is super easy. 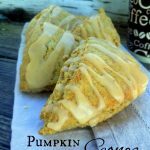 I love pumpkin & cream cheese together, too! 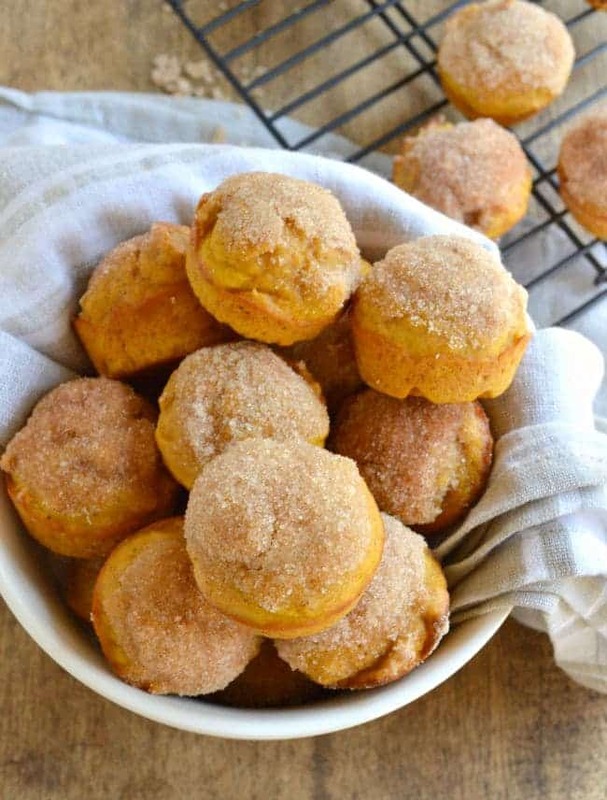 I seriously anticipate fall like nobody’s business because I am so so far into pumpkin everything. 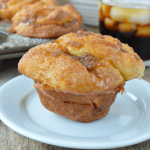 This looks delcious…and perfect for breakfast! Obviously I would be adapting to account for cream cheese yukkiness, but other than that drooool! And jas for cellular cupcakes! Whatever next?! I think you did a great job though! Edible homework – best ever! Edible homework is definitely the bast kind. We had so so so much fun with that project. I agree– this cake is super perfect for breakfast. I’ve started up my crazy workout program again… that makes cake breakfast completely acceptable!! Cake is always an acceptable breakfast I think! But, good on you for getting back to your crazy workout! I’m trying to get myself to stick to this running, but having to actually run outside is making me wimp out A LOT! Still, fingers crossed for this week! I like the last two pictures, very nice! Well thank you, thank you.. I have been wracking my head on what kind of dessert to make and I come upon this. Perfect timing.. This just went on the Thanksgiving menu!!! Yay!!! You’ll love this cake. 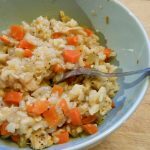 It is so easy and looks super great on the table cause it stacks up so high, but the bottom line is it TASTES super great! Oh me, too! I can’t ever get enough cream cheese frosting. Or pumpkin. 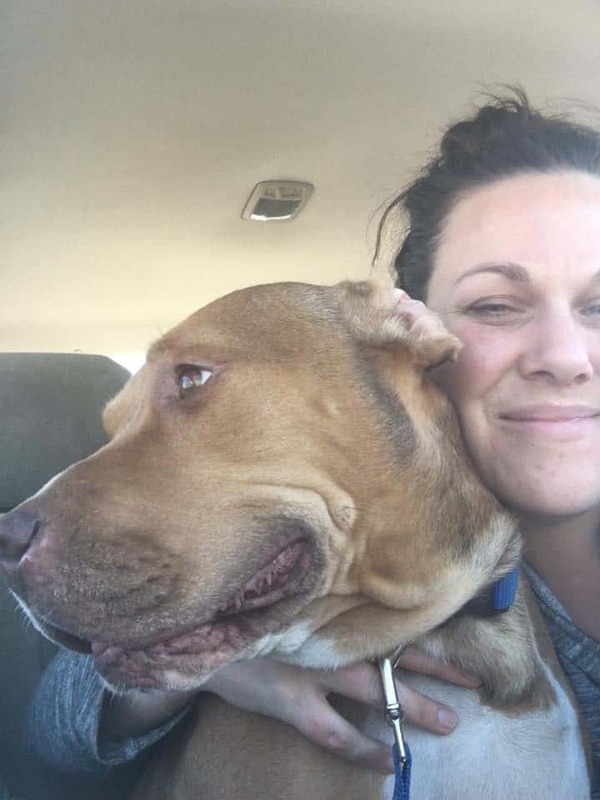 Oh Dog! This sounds so wonderful! Jen says she may try this one for the holiday! Well Maya would certainly love this…cake for breakfast! Too funny. This looks delicious. I personally could just eat the frosting and be completely satisfied. IT looks phenomenal!! Thanks, Ameena! Cream cheese I think makes it an acceptable breakfast, no? We should ask Maya. WOW~!!! I swallowed like 8 times reading this because I’m drooling lol I SO want this cake!!!! God I hate holidays lol like SO much but damn girl this is an awesome ‘accident’ cake!!!! The frosting alone…I mean sh*t get me a bowl of it and a spoon please!!! hahahahaha This was worth the wait!!! Haha you’re so funny! This cake is sooooo great. And super easy. And I usually have everything I need to make it. It’s one of my favorites!! In the process of making this right now, FYI – at no point in the instructions does it explain what to do with the 1 cup of pumpkin. Intuitively, I put it with the butter and sugar and eggs. Just letting you know you may want to update the instructions for those who don’t have a sixth sense about baking. 🙂 Great recipe otherwise, thanks! Thanks for the edit Kristin! When I pasted these instructions into the printer-friendly cards earlier this year I lost some things. i appreciate it! Let me know how it works out for you!! Awesome!! Thanks so much for letting me know Kristin! Hi there, what size can pumpkin do i use? Thanks. Looks fantastic! slice please! pinned! Yeah, I would pretty much eat this all at once! I love the spice combination in this – they’re the spices I look forward to using each holiday season. This cake looks beautiful; I would love a piece right now. I’m definitely going to give this ago as I love the flavor combination. Can somebody please me a bowl and a spoon cause I am gonna jump on it and have it all up. Oh damn! this is sooooooooooo tempting and I can’t resist eating it. I wish you could deliver it to me. It’s super tasty. 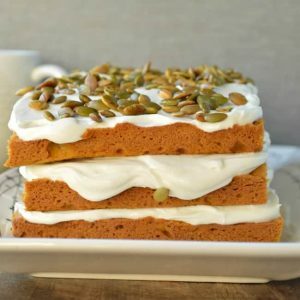 cake and cream cheese my all time favorite combination and here I got new pumpkin cake idea. Thank you for sharing this recipe. Pictures are seriously too delicious. It shows how should define a taste and look together.